The Irish election can be summed up in the experience at one polling station in Dublin at 7 a.m. on Friday morning last just as the voting began and recounted on national television by one of the guest experts, Dr. Michael Marsh of Trinity College. First in the door was a young man with suitcase in tow heading for the emigrant plane to America but stopping off first to cast his vote against the Fianna Fail government whose policies had forced him to abandon Ireland. If there was ever a symbolic moment that was it, a harbinger from the Gods of the carnage to come as the party that has led Ireland for most of it's 85 years was decimated beyond recognition. From 77 seats in the 2007 election and over 40 per cent of the vote, they slumped to 20 or so seats and 17 per cent of the vote. They have ended up with only one seat in Dublin, the capital city, the equivalent of a political neutron bomb. Several of the famed family dynasties, the Lenihans, Coughlans, Haugheys, all took direct political hits and their legacies may be at an end. Ironically the only famed family member to survive was Finance Minister Brian Lenihan, for many the face of the economic collapse whose cack-handed negotiations with the bankrupt Irish banks, European Union and IMF led indirectly to the $150 billion debt nightmare that the Irish now have over their heads. 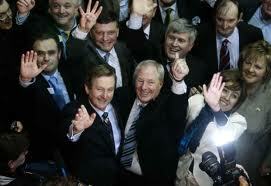 Ironically, Lenihan's brave battle against pancreatic cancer may have helped him win the seat when so many lost theirs. The mishandling of the Irish economy also destroyed the junior coalition partner, the Green Party who were completely obliterated, ending up with no seats in the next Dail (parliament). Incoming Prime Minister Enda Kenny called it a 'democratic revolution' clearly drawing comparisons with what happened in Egypt and elsewhere, but achieved directly through the ballot box. All changed, changed utterly as W.B. Yeats once remarked about the 1916 Easter Rising that won most of Ireland its eventual freedom. In five years time that Rising will celebrate its 100 anniversary, a powerful moment for the Irish psyche. Indeed, Enda Kenny has taken to referring to it as the ultimate goal of his expected five years in office, to deliver Ireland from the economic servitude it now is buckling under by the sacred anniversary. He has an incredibly tough task ahead, it is not clear even whether he will enter coalition with the Labor Party or will have enough seats when all the seats in Ireland's complicated election procedure are finally determined, to govern with the help of some independents. Either way he faces the mother of all battles and on a new battleground where he has utterly vanquished his usual rivals. It is a new dawn in Irish politics, but whether it can lead to a new day still remains to be seen.